Founder Martyn Laxton told us "Toby has been volunteering with us since September and showed a lot of promise from day one. He has overcome a lot of obstacles in his life and struggled at school because of his dyslexia, but seems to have found his niche here in our workshop and is never happier than when he's up to his elbows in oil or chatting to customers about our bikes! We're thrilled for Ride On - we're getting bigger and better - but also really excited to start Toby on his career path in an industry that he loves. Toby is a key part of our team now and brings with him lots of exciting new ideas'. 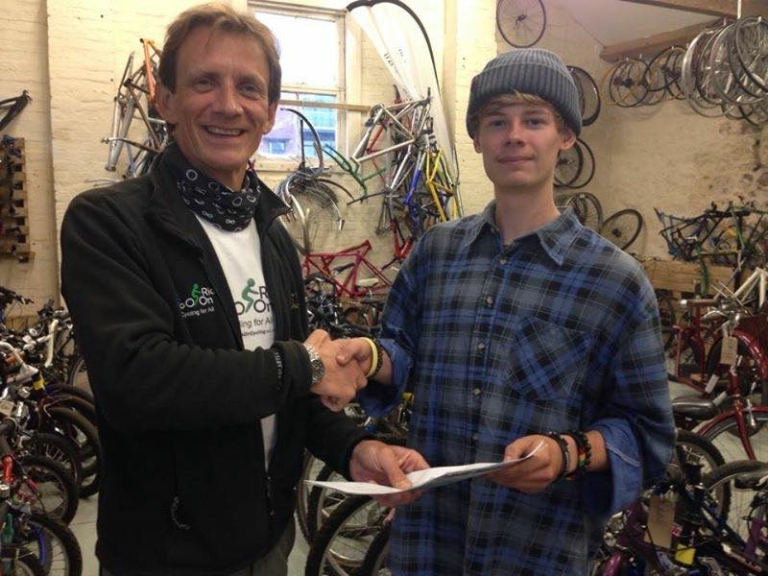 Toby has been enrolled in the National Apprenticeship Scheme which offers a grant to cover some costs, but Martyn and the team at Ride On still need of additional funding to cover his wages. If you can help please go to their website at donate what you can. Or maybe you know someone, or a company, who would like to sponsor Toby? Please get in touch with Martyn at ride-on@hotmail.co.uk to find out more. It all started in late 2011 when our founder Martyn Laxton was delivering Bikeability training (cycling proficiency for the 21st century ) in a local Devon primary school and only half the children there could access the free course because the remainder did not have a bike. He was amazed, bikes have never been more affordable and yet there were children missing out on a “rite of passage” of their childhood, namely access to a bike which could afford them the health giving fun and freedom that riding their own bike could bring! Martyn decided that this situation was unacceptable. He approached several organisations and began sourcing unwanted bikes, negotiated with a local prison for its inmates to strip and refurbish a selection of bikes and persuaded some lovely people he knew to give their time for free to help him get these bikes to children who would not have any chance of owning their own bike. Ride On are passionate about getting more people riding affordable bikes more often. Our dedicated team of volunteers is here to help you to build the simple skills to keep your bike on the road to provide you with sustainable transport for life! Ride On is a charity run by a few dedicated volunteers who want only to get more of us riding bikes, bikes that they recycle to a roadworthy standard so you can afford one! Amazing! Some of their bikes are only £60!! They accept donations of bikes, bits of bikes, spares and ANYTHING that helps to get more bikes recycled for the children and adults of Exeter.